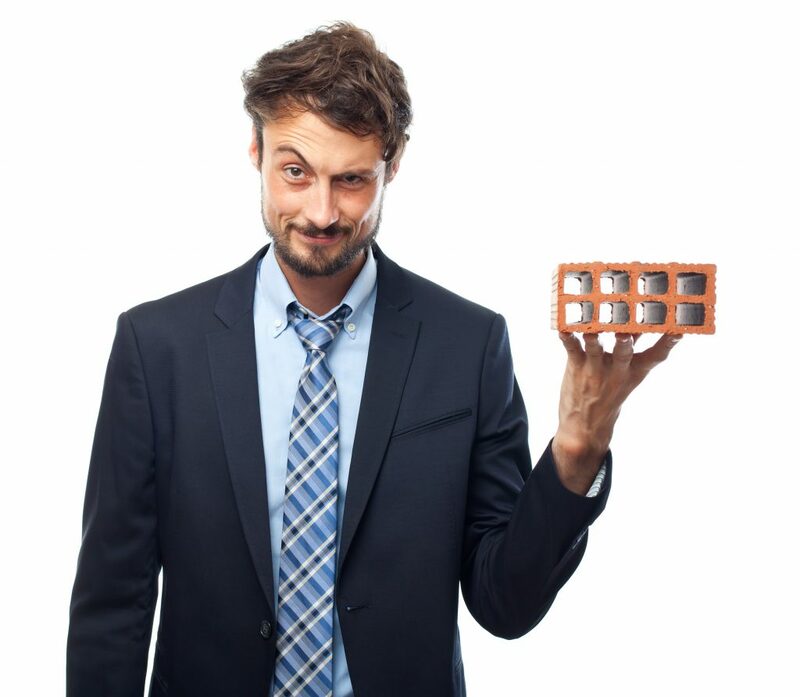 You are at:Home»Home Automation Products»Easy Z-Wave Smart Blinds Solution? Probably not the Teptron MoveZ Series. Kickstarter backers of the Teptron Z-Wave smart blinds MoveZ projects are furious about not getting their orders delivered on time. Other customers are irritated, stating that the product will not be the same as it is being advertised to be. Update, 20th of June 2018: Teptron sent us an official response regarding this case and our article. They stated that they don’t understand the complaints of former backers of the first MOVE Kickstarter and IndieGoGo campaigns about the functionality of the product. According to Teptron, the units they have shipped have the functionality that was initially advertised. In addition, Teptron stated that they have sold more than 35,000 units of their MOVE unit with Bluetooth support and that the Bluetooth version is available for purchase through their website and the orders for it are sent out within a week of purchase. Last, but not least, in their response, Teptron assured that they have shipped the orders to all backers that have confirmed their address and that all backers should contact them directly, so that the company can do another round of address confirmations. The company also stated that anyone who wants can receive a refund on their backing. After our original article was published, we also received confirmation from backers that after weeks of trying to receive a refund from Teptron, they finally did receive a refund. We are certain that Teptron is well-intended and are merely reporting the facts. We will also keep you updated with new information, as soon as possible, when it becomes available to us. Unfortunately, it seems that our vision about what the product will be, hasn’t really been met. As far as it seems, there are a lot of angry backers demanding answers from Temptron. This prompted us not only to update our initial overview of the product, but also to write up this piece, giving you an update and also hoping to understand the situation a little bit better. If nothing else, this might as well be an article to prove once again, why supporting crowdfunding projects is ALWAYS a risky endeavor. 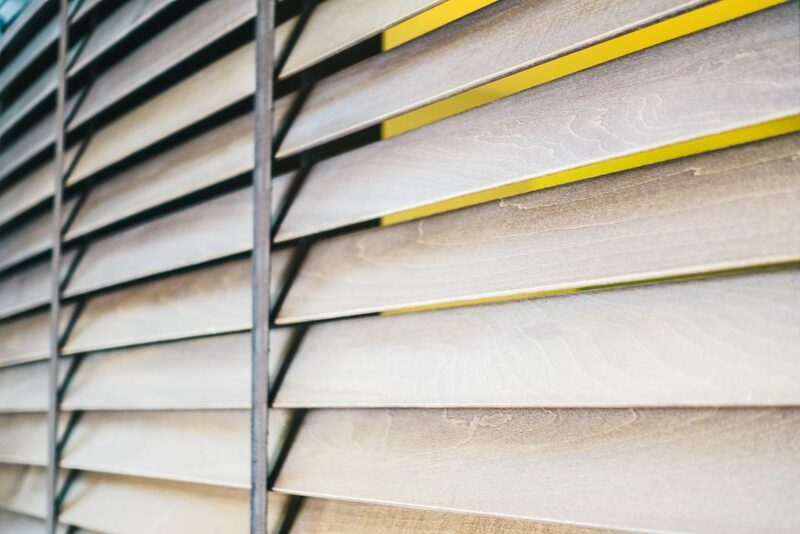 I don’t have an active photo of my old DIY Z-Wave blinds solution, so here’s a picture of some nice blinds instead. As you are probably already aware, the BYSH Media project and the buildyoursmarthome.co website was created out of love and passion for the smart home industry, particularly Z-Wave. When I joined the project back in 2016, I was primarily testing out the waters with different smart home solutions. It’s quite obvious that I was hooked. I wanted to understand how the technology works, the security, the available products and anything that would help me improve my everyday life. On the site, I primarily shared my thoughts and opinions for each and every product I had the chance to get my hands on working with BYSH Media, but also, I wanted to provide with “how-to” style solutions in relation to smart home problems I was encountering myself. One of the biggest problems I had back then is that I couldn’t find a proper Z-Wave based smart blinds solution on the market. Hence, I ended up creating my own (silly) solution. (You can still check the currently outdated Z-Wave blinds DIY solution right on this site) My solution included a pretty noisy servo and a relay, but in the process I ended up tweaking it and created a 3d-printed noise-cancellation box. It was a pretty wild and unnecessary complicated project. However, just a few moments later, I discovered and was presented with the Teptron MOVEZ kickstarter project. Right off the bat, being quite the critic of crowdfunded projects, I did my due-diligence to check the company’s background and all relevant info regarding the project, the potential distribution and supply chain they had and everything I deemed necessary at the time of writing. In fact, I even ended up writing quite a positive statement. However, Teptron manages to use the IndieGoGo platform, as it was intended, to exapnd onto their already successful MOVE product by introduction a Z-Wave version of the device. Unfortunately, it seems like I was quite wrong about the Teptron’s ability to deliver on their crowdfunding promises. For the past couple of months to an year, the team of BYSH Media has been working hard behind the scenes to deliver amazing new content that surpasses what’s currently on the website. We want to transition to a full-blown media outlet for the smart home, instead of being a small niche site run by smart home enthusiasts. And we are getting there and have prepared some AMAZING stuff for you. We’ll have a couple of announcements soon! Yet, in the process, we also didn’t manage to update the website that often. And what a better way to start up a better journalistic approach, then to scrutinize ourselves. We were quite optimistic about the Teptron project. We truly thought that a company of the caliber of Teptron that had a proven track record of successful products would use crowdfunding platforms as intended. Of course, as you are probably aware by now. It seems like this might not be the particular case. The reason why this issue came to light is that we suddenly, out of nowhere started seeing quite a huge traffic jump in our MoveZ overview article. We further received more than a few comments explaining their utter disappointment from Teptron. The comments on our website were quite explanatory. According to multiple comments, the original product of the company (the Move) simply doesn’t work as well as advertised. At the same time, Kickstarter backers seems to have trouble receiving refunds or comments regarding when they will receive an update with regard to their MoveZ product. In fact, our audience was so irritated by the product that they used the comment section as a “Buyer’s BEWARE” announcement board. Currently, at this point in time, we haven’t had the chance to review the MOVE product ourselves. Yet, a little bit of research would tell you that customers are not particularly happy. And when it comes to MoveZ, the interesting part, is that there are QUITE a few backers of the Kickstarter campaign that have stated that they still haven’t received their MoveZ product. 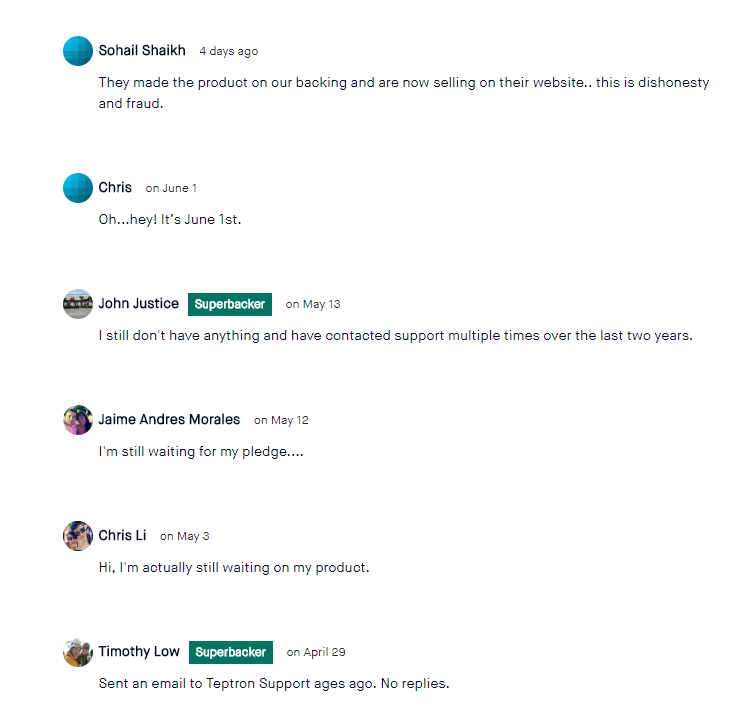 Just a few of the comments available on the Z-Wave MoveZ smart blinds Kickstarter page by Teptron. Plus, as aforementioned, what’s even more surprising is that the company reportedly doesn’t reply to any of the support or refund requests from those backers. Well, it seems like that it’s yet another bad case of a Kickstarter campaign failure! We’ve reached out to Teptron for comment and will update, if we receive anything. Its almost September. Beta users were announced (after a “delay”), yet no beta testers have received a unit. Teptron are once again silent. refusing to communicate with the people who have funded them. It is hard to believe this company has a future, with their lack of customer service and reputation off from the outset.